Rabbit anti Mouse Ly6A/E / SCA1. Synthetic peptide of mouse Ly6a. 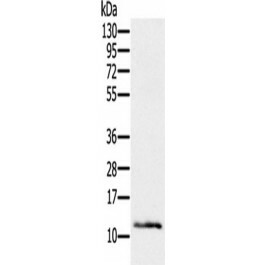 Sca-1 is an 18 kDa phosphatidylinositol-anchored protein that is a member of the lymphocyte antigen 6 (Ly-6) family. Sca-1 is encoded by the strain-specific Ly-6 E/A allelic gene. Its expression on multipotent hematopoietic stem cells (HSC) has been used as a marker of HSCs in mice of both Ly-6 haplotypes. Sca-1-positive HSCs can be found in the adult bone marrow, fetal liver, and mobilized peripheral blood and spleen in the adult animal.